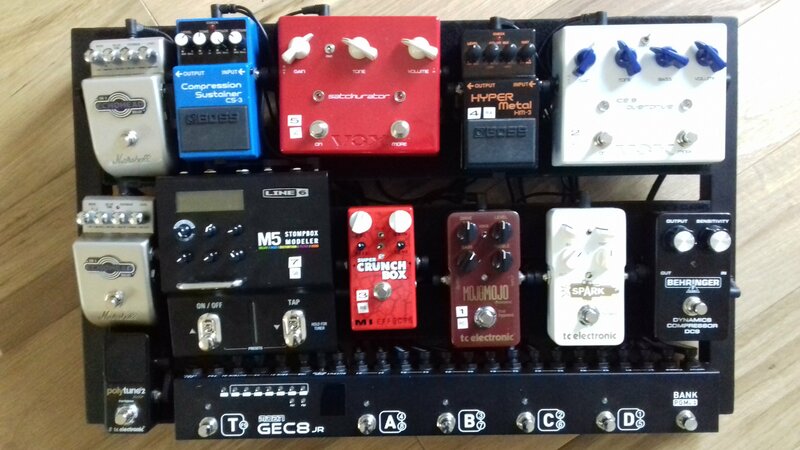 Lets have a look at your current pedal board. My latest version, for a new bluesy/rock/soul band. I play bass live, so this is only used at home for writing and recording. Nothing exotic, but gives a good range of tones. Apart from my Line 6 Helix, I've got a bunch of pedals. This is my singles board right now. Just my luck for the photo to be at an odd angle. Mine's pretty simple and set up about 80's sounds. The Amptweaker Tight Rock is at the centre of it all. The sidetrak channel goes into a Keeley Seeing Eye modded Boss DS1 (or sometimes a Joyo JF14 American Sound). 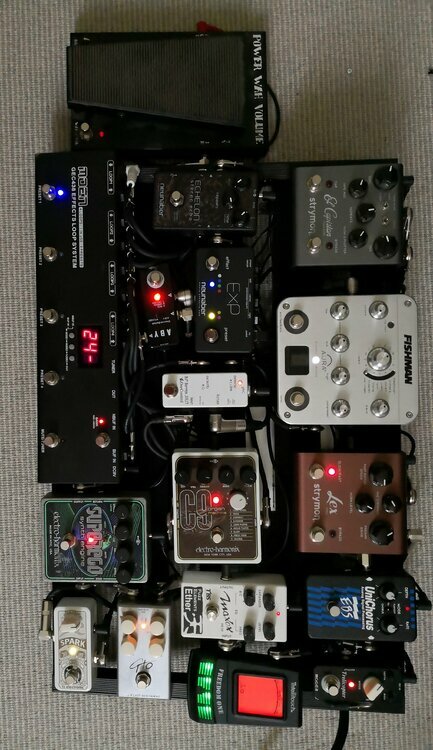 Before the Tight Rock is (in order) an Xotic Wah, Effectrode PC2 Compressor, Empress Parametric eq (which may go back to the bass board it came from). The Tight Rock then goes into a Nux Chorus Core (featuring stereo tri-chorus) and then a Mooer Ocean Machine for reverb and dual delays. I still have a Lexicon MPXG2 in storage which may replace some of it one day. This board does everything I ask of it from funky chorussed, scratched clean chords in the 4th strat position to Highway To The Danger Zone type distortion. Here's mine (in its current form). I only use it in the house for now as I'm still very much in the 'getting good' stage of guitar playing. Not quite as it currently stands.. 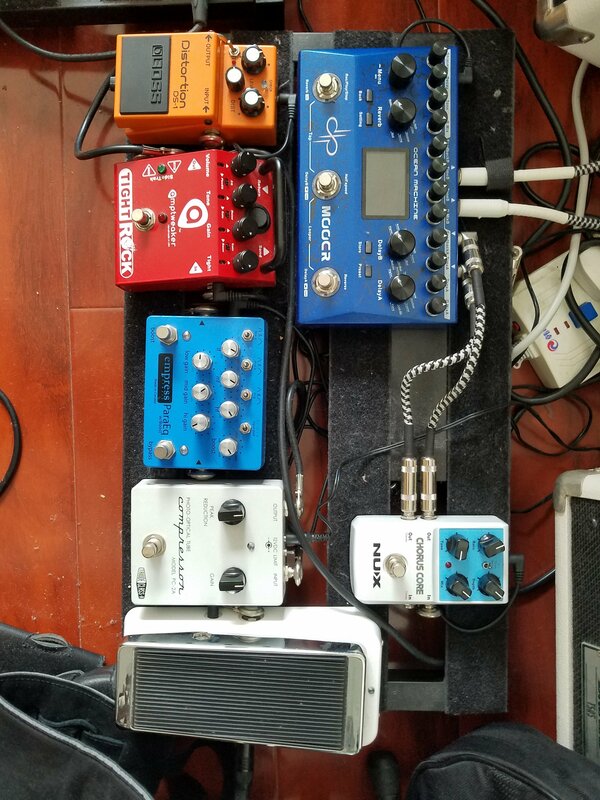 The wireless on the right is gone, the Maxon Fuzz is now replaced by a Suhr Riot, and I've somehow squeezed in a Subdecay Octasynth and a Digitech CabDryVR. Oh and an ISP Decimator G string. 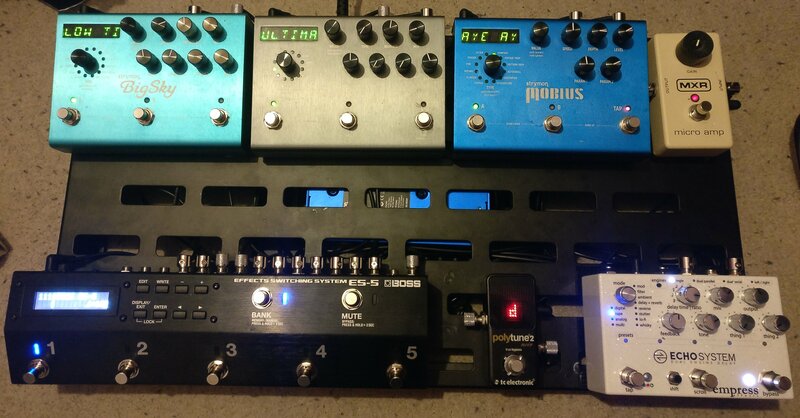 I can route the input via the Fishman Aura or not depending on whether I plug in an acoustic in, but can use any of the fx either way, and have both an amp and DI output (and can loop an amp preamp into the o/d loop). Power brick underneath and a pedalsnake cable to and from whatever its plugged into. You should see my old board. Now that was even wider.